Hummus has become as ubiquitous and pizza and hot dogs. But just because it's easy to find, doesn't mean it's all good. Here's a recipe for light and smooth hummus from a James Beard Award-winning chef. 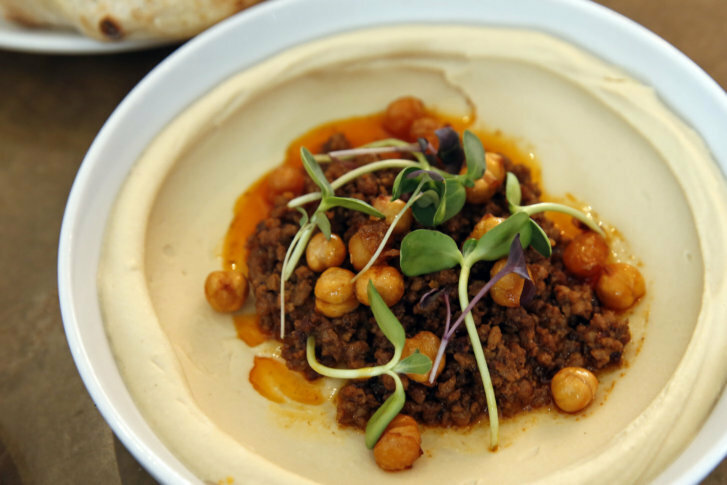 WASHINGTON — In the U.S., hummus has become as ubiquitous and pizza and hot dogs. It’s sold in snack packs at gas stations and is served alongside carrot sticks at sports bars. Grocery stores stock dozens of variations (avocado hummus, anyone? ), and no cookout is complete without a platter of hummus and pita chips. As easy as it is to find hummus, it’s equally as difficult to find good hummus. But Alon Shaya has done just that. The Israeli-born, Philadelphia-raised chef is known for the hummus he makes at his James Beard Award-winning New Orleans restaurant, Shaya. The dip’s light and smooth consistency has won praise from food critics around the country. Find the recipe to Shaya’s lamb ragu hummus on the James Beard Foundation’s website. The key, Shaya said, lies in the skins. Massaging the garbanzo beans and then boiling them — even canned beans — helps the skins come off easily. “And so the more skins you get off, the smoother the hummus is going to be,” Shaya said. The recipe for Shaya’s famed hummus (below) is one of many included in his new cookbook, “Shaya: An Odyssey in Food, My Journey Back to Israel.” The 400-plus page book reads more like a memoir than a manual, as Shaya shares recipes from the various stages of his life. “The whole thing really turned out to become this road map to my identity and how food really played a role in that,” said Shaya, who doesn’t skip over the details on how a troubled childhood turned into a career in food. He credits his high school home economics teacher with setting him on the path to success. When other teachers kicked Shaya out of their classrooms, they’d send him to her. “And she would give me a knife and tell me to slice a bunch of onions, and everybody thought she was crazy for giving me a knife, but she knew that that was really the way to get through to me,” he said. Shaya is one of the more recognizable names in what’s become an Israeli food movement in the U.S. Cities including Los Angeles and New York are seeing an influx of Israeli restaurants. In the last few years, D.C. welcomed Shouk and Little Sesame, and this spring restaurateur Ashok Bajaj will open a modern Israeli restaurant in Cleveland Park. There is no one defining flavor or food that best describes the cuisine. Rather, Shaya said it’s a true melting pot. “It’s all of the different cultures that thrive in Israel today and how all that food interacts with each other. So, it’s Bulgarian, it’s Yemenite, it’s Greek, it’s Moroccan, it’s German, it’s Polish,” he said. Drain the chickpeas and rinse them well. Gently — since they’re already soft — massage them in your hands to loosen the skins so that they slip off in cooking. Add the chickpeas (skins and all) to a pot with 1 1/2 quarts water. Bring it to a boil over high heat, then reduce the heat to medium. With a slotted spoon or small sieve, periodically skim away any of the skins that have floated to the top over the course of 10 or 15 minutes. If you’d like to track your progress, reserve the skins in a measuring cup, aiming to have about 3/4 cup of skins by the time you purée the beans. The more time you take here, the smoother the results will be. Meanwhile, combine the lemon juice and garlic, and let them steep for at least 30 minutes. Drain the chickpeas and combine then in a food processor with the garlic-infused lemon juice, 6 tablespoons water, olive oil, canola oil, tahini, salt, and cumin. Process for at least 5 minutes, until the hummus is very smooth and light. If you find that it’s still thick and grainy, add more water 1 tablespoon at a time, with the processor running, until it smooths itself into the consistency of buttercream frosting. Serve a room temperature, drizzled with more olive oil if you like.